You may have noticed that I haven’t really posted anything here in some time. That’s because I haven’t been doing any house projects. I’m working like a fiend right now (saving up for heating oil bills) and the only decorative thing I’ve been doing is needlepointing. How some ever, last weekend a couple of friends came over and we had a little sewing group to work on creating draft dodgers — those rolls of fabric filled with (in this case) kitty litter that you put on your windows and doors to try to keep the drafts out (see heating oil). I managed to make four — enough for the two windows in the parlor. I have all the sewing gear and kitty litter sitting there and am hoping to get up the gumption to do more soon-ish. The parlor and dining room are by far the coldest rooms in the house, so getting those done is my first priority. I hope to sew two for all the windows in the house (22 windows, so 44 dodgers) plus some for some of the closed off rooms’ doors this fall/winter. We’ll see how that goes. Has every Victorian house had a purple room at some point in its history? Perhaps. Mine does now. 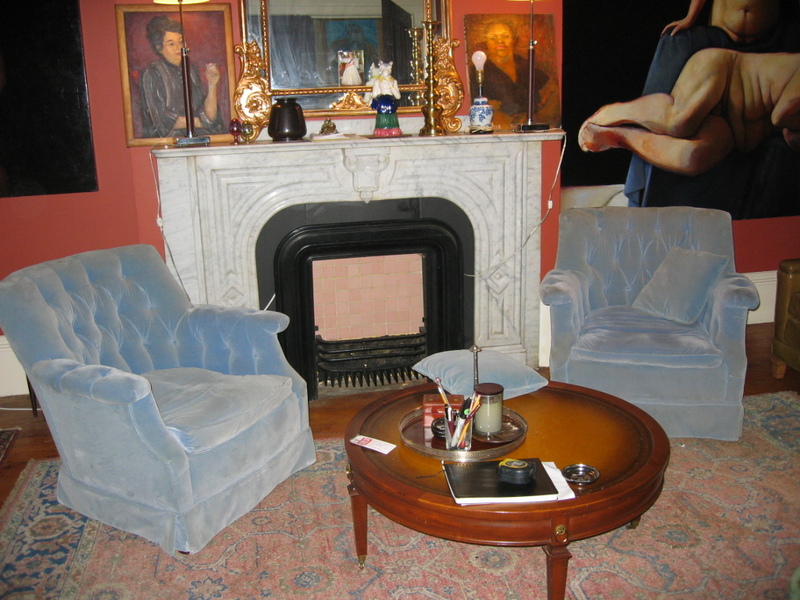 A purple parlor. I painted the living room over the weekend. After I put in the white carpet in the dining room, I found the red living room a bit too dark and oppressive. I went with Martha Stewart’s “Violet Aster” in the new (I guess) Behr “self-priming flat enamel” — not to be confused with the Behr paint and primer in one. What’s the difference? Who knows. Nobody at Home Depot knew. But the paint was lovely and went on very nicely. I couldn’t have done it without the help and support of the pets. I used a gallon plus a quart (I could have done it with a gallon if I did it all in one day and didn’t waste paint in the clean-up process) and put on two coats. With the paint and two roller covers (which I treat as single-use disposable items), it cost about $55 and maybe six hours of work (hard to say, because I took a lot of socialization breaks). I looooooove the color — the room seems very bright and airy. And Rod and Darlene look great in purple, too! Hey, Apartment Therapy, thanks for the paint colors! Apparently the editors at AT have been reading my blog and have suggested some ways to bring lavender into my living room. Okay, they probably haven’t been reading my blog, but it’s nice to see some additional lavender rooms. As the old saying goes, good things come to those who wait stalk CL incessantly. Casting a wide net for search geography helps, too. After losing out on several huge rugs, I found a 12′ x 17.5 number outside of New Haven, CT (about an hour and a half drive) for $200. I actually first saw it posted for $300 and called but didn’t hear back and then saw it re-posted the next day for $200. Score! It was folded up when I got it, but the sellers assured me the only condition issues were faded spots. That was not completely true — there are some major wear (or moth) holes, but you only notice them if you look really hard. The rug is a salmon color with lovely designs. I think not a “real” oriental rug, but good enough for me. It’s super thick (and weighs about a million pounds) and has a rubber strip around the edge. It took three people to bring it in the house and five to lay it out. Phew! So I rearranged some furniture in the living room (moved the viney couch up from the monkey room) and changed out some lamps and am really digging the room right now. It seems so much larger. I’m still thinking about going lavender on the walls to lighten things up, but it’s bugging me a lot less now with the room less cluttered. I tried to replicate the room layout photos that I posted the other day. I have been searching on the web for images of rooms painted with Martha Stewart’s Violet Aster paint and when I put the name of the paint in quotes, the photos of the room I just took are in the search results. Crazy Internet. I think it could look very dishy with the navy drapes, white trim, and gold ceiling (especially as I will leave them all untouched and will only be painting the walls) — it all hangs on the rug, though. Per Erin’s request, here is a panoramic view of the living room as is. The walls are a deep orange red color, they aren’t as blue-red as they appear in most of these photos. I’m off to look at (and hopefully come home with) a big old rug from CL tomorrow and if I get it, it will inform the color choice. I’m also going to move the green-ish leather couch down to the Monkey Room and move the viney Victorian couch (cat sitting on in photo) to the living room. I’m looking at the Martha Stewart Color Chart and am leaning towards Violet Aster or Wampum. Tags: What color should I paint my living room? Got these chairs for 9.99 each at the Sal Army Memorial Day weekend (between stoop painting and a trip to NYC, you know how it goes). And am now thinking a dusty lavender for the living room walls. 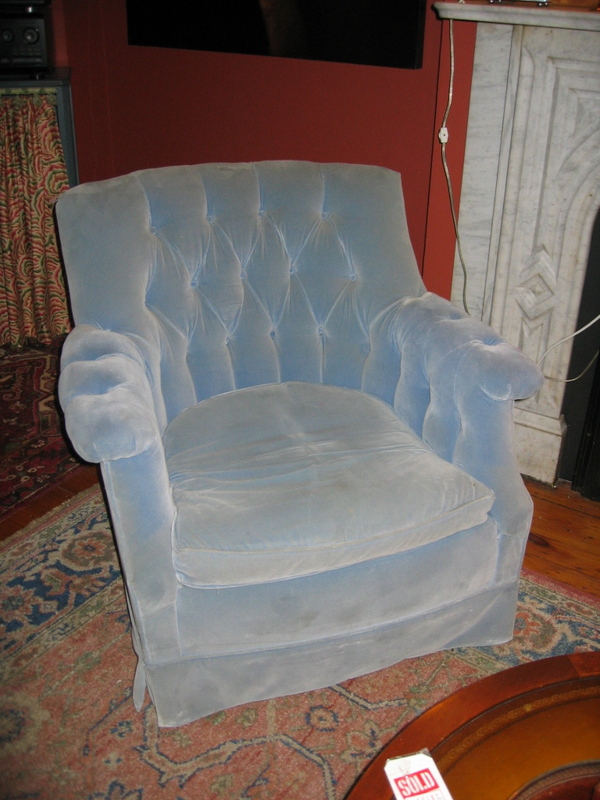 The chairs are tufted, light blue velvet (low pile) with dense but sink-in-to-able down cushions. So luxurious. So well made! A little dingy, but that will soon be fixed. Oo la la — I love these chairs! Tags: Gorgeous chairs from Salvation Army for 20 bucks.